Why do I get errors with compiling even after I have installed the supported compilers Microsoft Visual Studio 2010 Express and Windows SDK 7.1? If you have any of the following cases true, see the troubleshooting section at the bottom before proceeding with the SDK 7.1 installation. 2. When the download is complete, choose to run winsdk_web.exe. Depending on your security settings, you may be prompted by User Account Control (UAC) to confirm “making changes to this computer”. 3. After several seconds, the Setup Wizard will appear. 4. Click through the wizard, accepting the license agreement and not changing any of the installation folders. 5. Continue through the wizard to download and install the SDK. Depending on the speed of your Internet connection, this step will take several minutes to an hour or more. 6. The setup wizard finishes. Install the SDK 7.1 using the instructions above. If SDK 7.1 was already installed, but with a message saying .NET 4 could not be installed due to the presence of .NET 4.5, you may need to uninstall .NET 4.5 first as well and retry. Remove the 2010 Redistributable packages (both x86 and x64). For that, navigate to the windows control panel -> click on "programs" -> click on "Programs and Features" -> select the required programs to be removed. Install SDK 7.1 using the instructions above. Apply the SDK 7.1 patch. If you have both Microsoft Visual Studio C++ 2010 SP1 and SDK 7.1 already installed, but running into various errors during compilation, apply the SDK 7.1 patch to fix the issue. Install Visual Studio C++ 2010 (if not already installed). Either Professional or Express works. Sometimes 'mex -setup' does not list the installed compilers although compiler is installed in the system. This issue is very sporadic in nature and occurs when is no .xml(e.g. mex_C_win64.xml for mingw) file present at 'C:\Users\<username>\AppData\Roaming\MathWorks\MATLAB\<MATLABRELEASEFOLDER>' location. Un-installation of all the instances of Microsoft visual studio and Microsoft C++ redistributables from the system and then installing Microsoft SDK 7.1 in administrator mode does not help here. A temporary workaround for this issue is to copy the XML file from another machine with the similar setup to the location said above and then run mex -setup. Upgrading Microsoft Visual Studio C++ 2010 to SP1. The steps described here does NOT work and seems not to be tested by those answering the question. it is seen that Microsoft has stopped bug fixing the C+++ compilers in the SDK. To avoid that, use the steps in the link above. I disagree, the method works very well. Sorry Peter, the old answer did not account for the ammintrin.h error. We've since updated the answer to reflect the possibility of that error. It occurs when SDK 7.1 is installed by itself and the patch is applied. The patch expects header files that are only available with the Visual Studio 2010 SP1 installation. So installing Visual Studio 2010 SP1 should fix the issue. Hi, I follow above steps and i successfully install microsoft windows sdk 7.1 . when i type "mex -setup" in matlab, it didn't show Microsoft software development kit in the list of compilers. What is the problem here. can anyone help? Which operating system are you using, Biruntha ? Biruntha, I do not have an answer for you, but for information of other people who might be reading this, I will note that in another question you indicated you are running R2013a . That version does support SDK 7.1 so the reason for your difficulty is something I do not know at present. The WinSDKSamples_x86.msi file does appear to exist in the location named, so either you had a temporary glitch or you had a network problem or you have interference from an antivirus or a firewall program. I have tried installing sdk on my windows 8.1, it says installation failed. Can someone help me out with this? 1. Uninstall all Visual Studio programs/compilers/redistributables etc. During installation, under the "Installation Options" menu, UNCHECK the "Visual C++ Compilers" and "Microsoft Visual C++ 2010" components. 7. Reinstall the Microsoft Visual C++ 2010 redistributable packages. 8. Open Matlab, and run through the "mex -setup" steps to check the compilers have been linked with Matlab. I ended up having the problem of not being able to uninstall the SDK in step 3. Some problem that was documented here. What I did was I disabled my internet connection and using the new SDK 7.1 ISO downloaded in step 4, I was able to uninstall successfully. Also, from the other mathworks link above, I found it was not possible for me to apply the 7.1 patch without a .NET framework installed. So that is why I recommend step 5 before step 6. Otherwise steps 6 and 7 are verbatim from the link. Thank you very much. It resolves all the problem in my case! and I successfully installed SDK 7.1 on windows 10. After mounting the image, open F:\Setup\SDKSetup.exe directly. See "Install Instructions" in the webpage offline ISO image to understand which ISO image to download. hello,I Uninstall .NET Framework 4.5,.NET Framework 4.6,Visual Studio C++ 2010 toVisual Studio C++ 2015,but when I install SDK still can't choose the visual C++ compilers.Then I check files in program files,and delete all file about .Net.Now,I can't run the winsdk_web.exe. Can you give me some advice? I tried installing sdk on my windows 8.1. It says installation failed as shown below. Can someone help me with this? and I got the following error message: Error: The Microsoft Windows Software Development Kit (SDK) installation is incomplete. Please be sure that the .NET Framework is installed correctly before attempting to reinstall the SDK. Error using mbuild (line 189) Unable to complete successfully. I am using R2013b version. Can you suggest anything to solve the problem? If you are like me, you have .Net 4.5 installed. This replaced 4.0 which SDK 7.1 needs. I tried installing .Net 4.0 and it refused saying 4.5 was the newer version. My guess is SDK 7.1 will work with .Net 4.5, but Matlab is checking for 4.0 and complaining needlessly. Can any Matlab support comment on this? 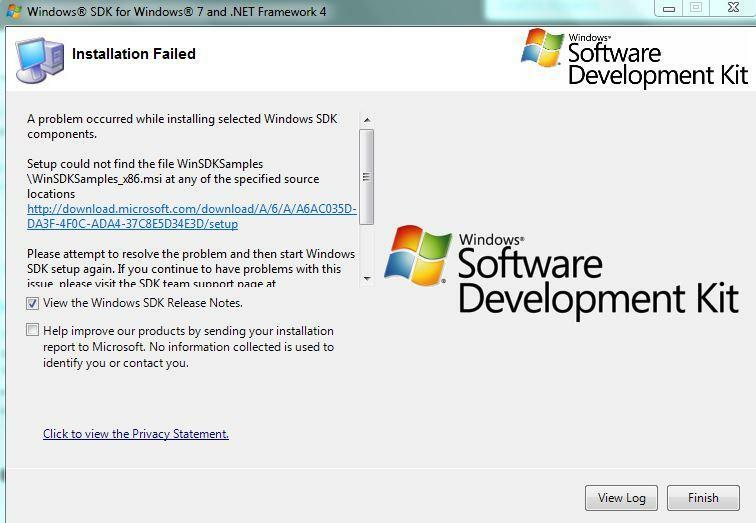 MATLAB does work with .NET 4.5, but the installation of SDK 7.1 may fail if .NET 4.5 is already installed. 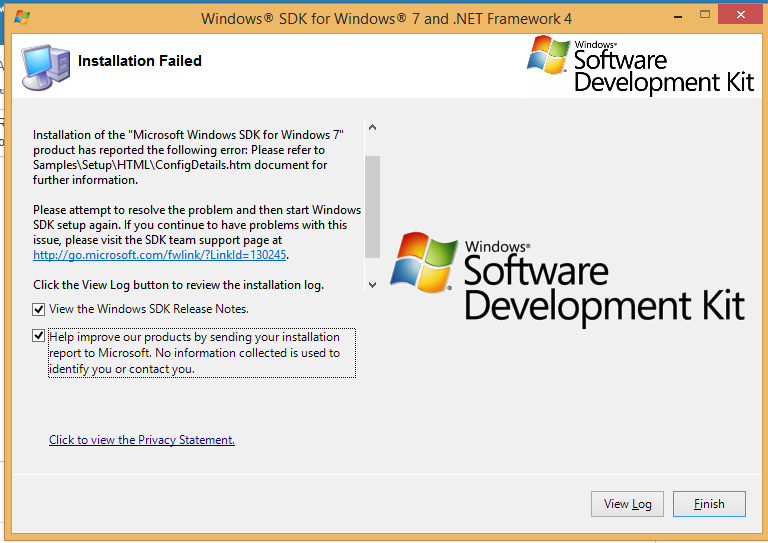 So to install SDK 7.1 properly, you may need to uninstall .NET 4.5 first, install SDK 7.1, and then reinstall .NET 4.5. Note that Windows 8 already has .NET 4.5 installed by default, so Windows 8 users may need to go through the same steps to install the SDK 7.1. I had the same problem... To be specific, I got the "... is incomplete." error when I chose the SDK, and "SDK is not installed." error when I chose the MSVC++ compiler. I dug in pretty deep till I realized that the problem was that I had installed the SDK to a different drive... And some components of the SDK have to be in the boot drive... So when the path of the SDK was queried for in the registry (HKLM\Software\Microsoft\Microsoft SDKs\Windows\v7.1\InstallationFolder), it contained the C: path... but that path, consisting of only compulsorily-on-c-drive components, did not have the rest of the executables. My solution was to uninstall the SDK, and then reinstall, taking care not to add any of those compulsorily-on-c-drive components (check the disk usage, should be 0). Then the SDK option works. Worst comes to worst, edit the appropriate .STP files in matlabroot\bin\win64\mbuildopts . Click the View Log button to review the installation log. To exit, click Finish. So, after reading about the .NET frameworks 4.0 and 4.5 I noticed that in Windows 8.1, which I'm using, 4.5 is already included and I can not uninstall it, only turn it off which I did. However, this doesn't help. The installation fails. Does anyone have a solution for me maybe? I have been trying to install Windows SDK in my PC. I am facing the exact same problem while installing Windows SDK. I have Windows 8.1 and .NET framework wont uninstall from my computer. After accomplishing step 3 I have both 'Visual C++ 2010 Redistributable packages' and 'Microsoft Visual C++ Compilers 2010 SP1 Standard' installed. Then do I really need to reinstall them again as it said in step 4? We've updated the answer since then. If the redistributables are already there, and you have everything working, reinstalling them is not necessary. I'm installing the SDK 7.1 patch from the link mentioned above. The installation seems to be stuck and doesn't go past the 15% mark. 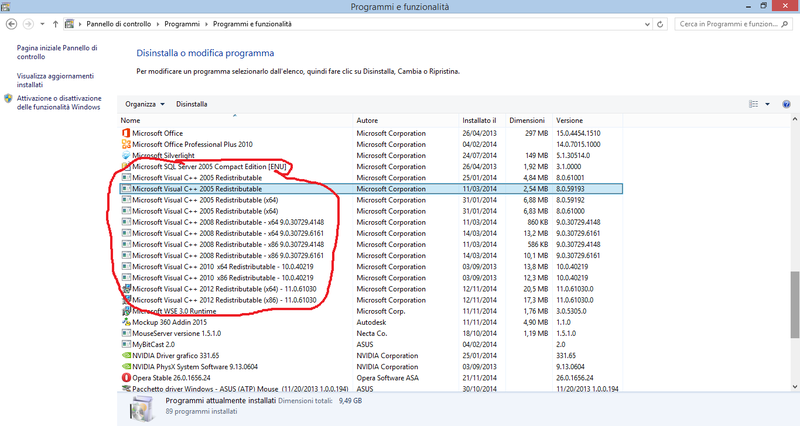 I have windows 8.1 and on my computer there are Microsof Visual C++ 2005/2008/2010/2012 (see attached image) In order to install Windows SDK 7.1, first I have to uninstall all these Microsoft Visual C++ installed , then install SDK 7.1 and at the end re-install the all Microsoft Visual C++ unistalled before, it's right? And if I uninstall all Microsoft Visual C++, I risk to compromise my computer? "Error: The Microsoft Windows Software Development Kit (SDK) installation is incomplete. Please be sure that the .NET Framework is installed correctly before attempting to reinstall the SDK." when running the compiler setup. to uninstall it. After running the SDK installation again following the steps outlined by the support team above, the Matlab compiler setup was satisfied and I can run the Matlab compiler again. 1) Is it necessary to install SDK 7.1 patch? It is not one of the steps but is included in troubleshooting - install or not? 2) Is it necessary to install all the SDK packages? Samples, Intellisense, etc. What's the minimim install for mex to work. 1) You only have to install the patch if you have the situation that Microsoft Visual Studio C++ 2010 SP1 was already installed, then you tried to install SDK 7.1 on top and it failed (see TROUBLESHOOTING section) 2) I am afraid that there is no such minimum list of required components available. This will also depend a bit on your use case. I recommend to contact Technical Support if you need more details. I followed all the above mentioned steps but am still not able to find the Windows SDK 7.1 compiler in the compiler list on writing mex -setup in MatLab. What do I do? Which operating system are you using, and which MATLAB version? If you are using Windows 10, then you will find it difficult to use SDK 7.1; I do not know if Microsoft fixed the bugs that prevented it from being used. Hello, I use a version R2015a on win10,and I have a error below.Can you give me some advice? SDK 7.1 is not compatible with Windows 10 -- not unless they have fixed some bugs in the some run time libraries and in installing .NET. I do not know if you could get VS 2013 Professional to work. I would doubt any earlier versions of VS would work. Perhaps one of the Intel compilers would work. Hello, I've tried to install SDK 7.1 but it appears a message which says that I need to install the RTM.NET Framework 4 before. When I go to the website expecified (<http://go.microsoft.com/fwlink/?LinkID=187668>) a message is shown: "Your connection is not secure", and I can't download the .NET Framework4. Any advice to solve this problem? Thank you! Possibly https://www.visualstudio.com/downloads/ and go down to "Other Tools and Frameworks" and click on there ? For Windows 10, there is a problem, as you cannot uninstall .NET 4.5 (my memory tells me) in order to install .NET 4.0 . I do not know how that problem was solved. I think I heard that a patched version of SDK 7.1 was created, but I am not at all certain of that. Aneesh Subrahmanian: which operating system were you installing on to? Error using mex No supported compiler or SDK was found. For options, visit http://www.mathworks.com/support/compilers/R2014b/win64.html.